My family loves lasagne. Served with vegies or a salad, it is easily a favourite. My mother’s lasagne is second to none with a creamy béchamel sauce combined with a rich mince mixture, it is easy to get lost in the deliciousness of it and sneak back to the kitchen for extra spoonfuls, stolen straight from the dish. Unfortunately, with the hecticness of life with children, the luxury of spending bucket loads of time fiddling around making this meal can no longer always be afforded so this ravioli bake is the perfect alternative. It is important to me and the peaceful running of my week, to have the bulk of our meals prepared before the onset of the working week. Therefore, I dedicate the best part of my Sunday to cooking a variety of meals and snacks which I can circulate through the dinner table throughout the week. In order to make this routine sustainable, I have sourced as many quick and simple recipes as I can so as not to take up my entire Sunday. If I can’t have it prepped and done with in less than an hour I don’t do it. 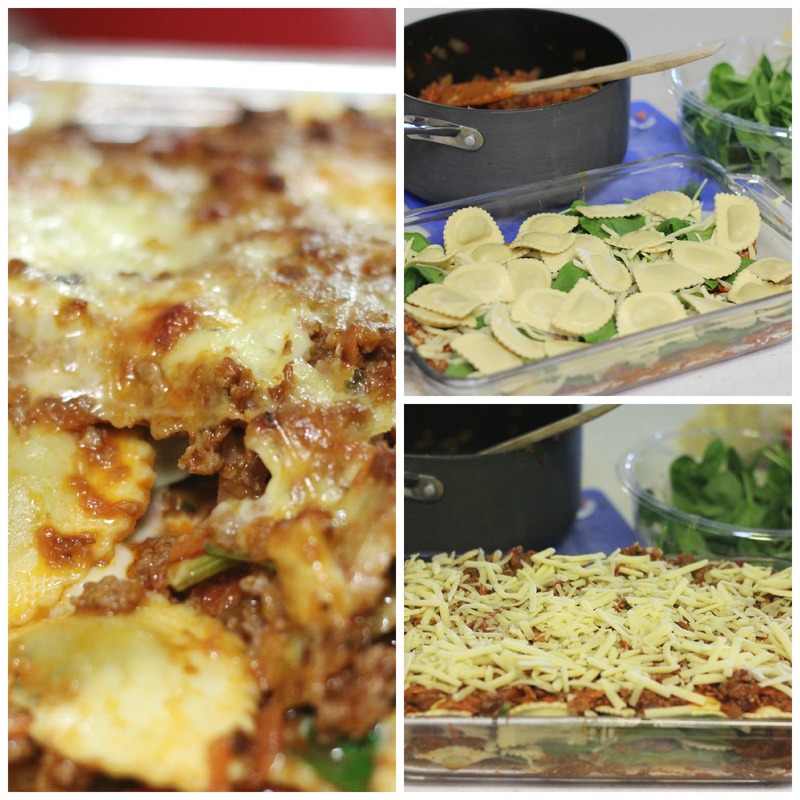 So this week, I resurrected a family favourite and made a simplified version of lasagne. I should note that this recipe can easily be made more gourmet by making the ravioli and the meat sauce from scratch but I didn’t bother and had no complaints from the family. Fry onion and garlic in a little oil until softened. Add mince, break up lumps and allow it to brown. Stir through carrot and zucchini. Add pasta sauce (or make your own from here). In a baking dish, spread a little of the mince mixture and then layer it with ravioli, followed by spinach leaves and a little sprinkle of cheese. Bake in a moderate oven for 25mins or until golden and bubbly. I served with a fresh garden salad but this is not necessary. Enjoy and don’t forget you can share your cooking on Instagram with the tag #ppcktastytuesday so we can all be inspired! This entry was posted in Recipes and tagged Easy Meals, Healthy Childrens meals, Lasagne, Ravioli on September 16, 2014 by peacefulparentsconfidentkids. The ravioli bake looks delicious. Do you cook the ravioli first? Hi Christina, I used fresh (not dried) ravioli so i didn’t need to cook it first. The juices from the sauce are enough to cook it. I hope you enjoy it.